Loci maiorum eventuum per Victoriam Angliae Normannicam anno 1066. 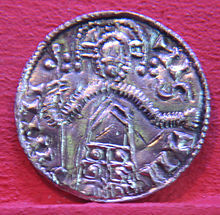 Rollo et proles Gulielmus I, princeps Normanniae (Comes Rothomagi, Longa Spata appellatus), et Ricardus dux Normanniae (Comes Rothomagi, Sine Timore appellatus). Pictura saeculi tredicimi. Nummus Sweyn II, regis Danici. Turris Londinii, a Gulielmo Conquaestore ad Londinium cohibendum primum aedificatum. Victoria Angliae Normannica fuit incursio et possessio Angliae per exercitum militum Normannorum, Bretonorum, Francorumque saeculo undecimo facta, Gulielmo II Normanniae duce, postremo Gulielmo Conquaestore appellato. ↑ Douglas 1964:216 et nota 4. Bates, David. 1982. Normandy Before 1066. Londinii: Longman. ISBN 9780582484924. Bates, David. 2001. William the Conqueror. Stroud: Tempus. ISBN 9780752419800. Bennett, Matthew. 2001. Campaigns of the Norman Conquest. Essential Histories. Oxoniae: Osprey. ISBN 9781841762289. Carpenter, David. 2004. The Struggle for Mastery: The Penguin History of Britain 1066–1284. Novi Eboraci: Penguin. ISBN 9780140148244. Chibnall, Marjorie. 1986. Anglo-Norman England 1066–1166. Oxoniae: Basil Blackwell. ISBN 9780631154396. Chibnall, Marjorie. 1999. The Debate on the Norman Conquest. Issues in Historiography. Mancuniae: Manchester University Press. ISBN 9780719049132. Ciggaar, Krijna Nelly. 1996. Western Travellers to Constantinople: the West and Byzantium, 962–1204. Lugdunensi Batavorum: Brill. ISBN 9789004106376. Clanchy, M. T. 2006. England and its Rulers: 1066–1307. Ed. 3a. Blackwell Classic Histories of England. Oxoniae: Blackwell. ISBN 9781405106504. Crouch, David. 2007. The Normans: The History of a Dynasty. Londinii: Hambledon & London. ISBN 9781852855956. Crystal, David. 2002. The English Language: A Guided Tour of the Language. Ed. 2a. Novi Eboraci: Penguin. ISBN 0141003960. Daniell, Christopher. 2003. From Norman Conquest to Magna Carta: England, 1066–1215. Londinii: Routledge. ISBN 9780415222167. Gravett, Christopher. 1992. Hastings 1066: The Fall of Saxon England. Campaign, 13. Oxoniae: Osprey. ISBN 9781841761336. Heath, Ian. 1995. Byzantine Armies AD 1118–1461. Londinii: Osprey. ISBN 9781855323476. Higham, Nick. 2000. The Death of Anglo-Saxon England. Stroud Britanniarum Regni: Sutton. ISBN 9780750924696. Huscroft, Richard. 2009. The Norman Conquest: A New Introduction. Novi Eboraci: Longman. ISBN 9781405811552. Huscroft, Richard. 2005. Ruling England 1042–1217. Londinii: Pearson/Longman. ISBN 9780582848825. Kaufman, J. E., et H. W. Kaufman. 2001. The Medieval Fortress: Castles, Forts, and Walled Cities of the Middle Ages. Cantabrigiae Massachusettae: Da Capo Press. ISBN 9780306813580. Keynes, Simon. 2001. Charters and Writs. Blackwell Encyclopaedia of Anglo-Saxon England. Ed. Michael Lapidge, John Blair, Simon Keynes, et Donald Scragg, 99–100. Oxoniae: Blackwell. ISBN 9780631224921. Keynes, Simon 2001. Harthacnut. Blackwell Encyclopaedia of Anglo-Saxon England. Ed. Michael Lapidge, John Blair, Simon Keynes, et Donald Scragg, 229–230. Oxoniae: Blackwell. ISBN 9780631224921. Lawson, M. K. 2002. The Battle of Hastings: 1066. Stroud Britanniarum RegniL Tempus. ISBN 9780752419985. Liddiard, Robert. 2005. Castles in Context: Power, Symbolism and Landscape, 1066 to 1500. Macclesfield Britanniarum Regni: Windgather Press. ISBN 9780954557522. Loyn, H. R. 1984. The Governance of Anglo-Saxon England, 500–1087. Stanfordiae Californiae: Stanford University Press. ISBN 9780804712170. Marren, Peter. 2004. 1066: The Battles of York, Stamford Bridge & Hastings. Battleground Britain. Barnsleiae Britanniarum Regni: Leo Cooper. ISBN 9780850529531. Singman, Jeffrey L. 1999. Daily Life in Medieval Europe. Daily Life Through History. Westport Connecticutae: Greenwood Press. ISBN 9780313302732. Stafford, Pauline. 1989. Unification and Conquest: A Political and Social History of England in the Tenth and Eleventh Centuries. Londinii: Edward Arnold. ISBN 9780713165326. Stenton, F. M. 1971. Anglo-Saxon England. Editio 3a. Oxoniae: Oxford University Press ISBN 9780192801395. Thomas, Hugh M. 2003. The Significance and Fate of the Native English Landowners of 1086. The English Historical Review 118(476):303–333. doi:10.1093/ehr/118.476.303. JSTOR 3490123. Thomas, Hugh M. 2003. The English and the Normans. Oxoniae: Oxford University Press. ISBN 9780199251230. Thomas, Hugh M. 2007. The Norman Conquest: England after William the Conqueror. Critical Issues in History. :anhamiae Terrae Mariae: Rowman & Littlefield. ISBN 9780742538405. Walker, Ian. 2000. 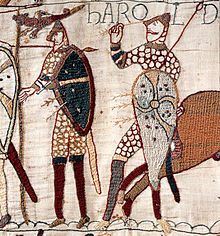 Harold the Last Anglo-Saxon King. Gloucestershire: Wrens Park. ISBN 9780905778464. Williams, Ann. 2003. Æthelred the Unready: The Ill-Counselled King. Londinii: Hambledon and London. ISBN 9781852853822. Williams, Ann. 2004. Eadric the Wild (fl. 1067–1072). Oxford Dictionary of National Biography. Oxoniae: Oxford University Press. doi:10.1093/ref:odnb/8512. Williams, Ann. 2000. The English and the Norman Conquest. Ipswich: Boydell Press. ISBN 9780851157085. Essential Norman Conquest. Osprey Publishing. Normans: background to the Conquest. BBC. Novissima mutatio die 19 Octobris 2016 hora 22:01 facta.